The club, currently under temporary management of the Tianjin Football Association, is looking for a new investor which has to be a Tianjin-based company, as per CFA requirements. 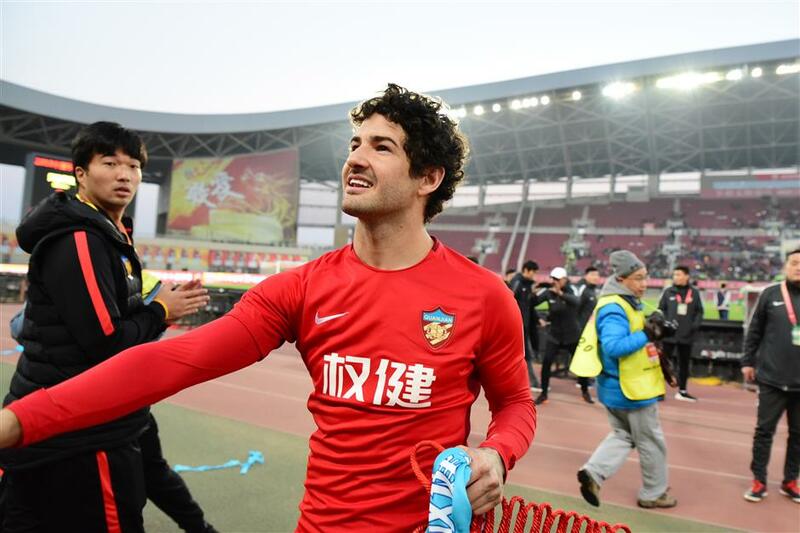 Tianjin Quanjian's Brazilian midfielder Alexandre Pato. Chinese Super League side Tianjin Quanjian has changed its name to Tianjin Tianhai after its major investor, the Quanjian Group, came under investigation for suspected illegal commercial activities. The club, which is currently under temporary management of the Tianjin Football Association, is looking for a new investor which has to be a Tianjin-based company, as per the Chinese Football Association's requirements. According to the National Enterprise Credit Information Publicity System's website, the club completed its name change on Thursday, though the name of its shareholder and financial investment information remained the same. "Tianhai" is a neutral name. The north China club's previous investor, Tianjin-based herbal medicine company Quanjian Group, has been under investigation since last month for its involvement in suspected pyramid sales and false advertising. Company boss Shu Yuhui is under criminal detention. Incidentally, the Quanjian-backed table tennis club removed the words "Quanjian" from its name some days back. Tianjin Quanjian finished 9th in last year's CSL. It has been one of the big-spending Chinese football clubs since Quanjian took over at the end of 2015. It was promoted to the CSL after topping the second-tier league in 2016, and placed third in the 2017 CSL. The team boasts star players like Brazilian midfielder Alexandre Pato, as well as Chinese national team players like Zhang Lu, Zhao Xuri, and Liu Yiming. Its current manager is South Korean Choi Kang-hee while Italian Fabio Cannavaro and Portuguese Paulo Sousa are among its former coaches. The team is currently in Abu Dhabi, United Arab Emirates, for winter training. Its players are also reported to be receiving wages as usual, though orders have been given that no player should speak to the media. Incidentally, the Chinese national team, under veteran Italian manager Marcello Lippi, is also in the UAE for the ongoing AFC Asian Cup tournament. The 2019 CSL starts in March. Needless to say that the club will hardly stay competitive in the new season if no new investor is found in time.